Connected to the Fallsview Casino this 4 diamond hotel features Fallsview guestrooms and luxurious Whirlpool rooms. Overlooking Niagara Falls and just minutes from major Niagara Falls Attractions, this hotel features an Indoor walkway to Niagaras newest Fallsview Casino. Complete fitness center including indoor swimming pool with waterfall, event, meeting, conference facilities and Starbucks are just a few of the amenities offered. Choose from 13 meeting rooms along with full services and amenities, the Fallsview Hotel is confident that your meetings with us will exceed all expectations. With over 14,000 sq.ft of flexible meeting and banquet space, accommodating groups of up to 350, the Four Points by Sheraton Hotel is a fantastic location for your next meeting or event. 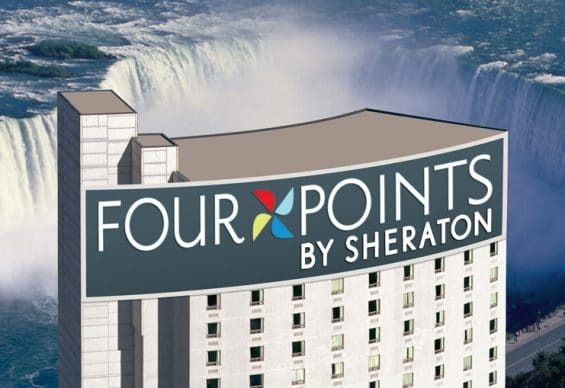 The Four Points by Sheraton is a 4 Diamond hotel located in the heart of the Fallsview District on Fallsview Boulevard. This hotel offers an in house East Side Marios Restaraunt, premier fallsview and family suites and is located accross the street from Niagara’s newest casino, the Fallsview Casino Resort. This Niagara Falls Hotel offers 466 luxurious guestrooms including Fallsview Suites. All of this is located only 450 metres from the Horseshoe Falls and all of the attractions along the Niagara Parkway. The Four Points by Sheraton Hotel is complete with fitness center including indoor swimming pool with waterfall, event, meetings and conference facilities are just a few amenities offered. Ice and soft drink machines. Located in the lobby of the Four Points by Sheraton is East Side Mario’s is the taste of Italy. Enjoy the warmth of authentic Italian cooking at East Side Mario’s. We use the freshest ingredients and authentic Italian recipes to bring you a refreshing culinary experience. Enjoy our signature – unlimited salad or soup and garlic home loaf. We’ve added tempting new dishes and retained our old favourites that you have fallen in love with. Four Points by Sheraton offers the ultimate in meeting requirements. Each of our meeting rooms are designed with special attention to space requirements to accommodate the needs of various meeting sizes. Choose from 4 meeting rooms along with full services and amenities, the Fourpoints by Sheraton is confident that your meetings with us will exceed all expectations. Over 5300 sq.ft of flexible meeting and banquet space, accommodating groups of up to 350, along with spacious and comfortable room accommodations, the Four Points by Sheraton Hotel is a fantastic location for your next meeting or event.